Separate PG Entrance notifications from Deemed University creating confusions - AcrossPG Exams! Despite the announcement of single entrance test for PG seats in India via the CBT mode NEET PG extending from 23 Nov to 6 Dec 2012, some deemed universities are announcing separate entrance tests. Where as NBE maintains that these notifications are illegal. Causing panic and confusion amoung already distressed medicos aspiring PG seats. 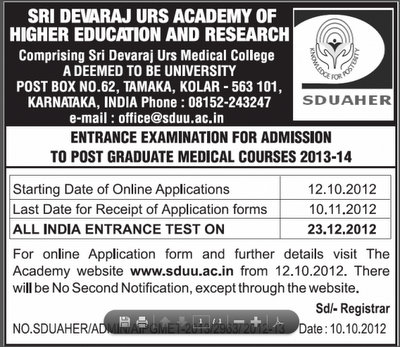 Sri Devaraj Urs University comprising Sri Devaraj Urs Medical College ( Deemed to be University declared Under section 3 of UGC Act, 1956, vide Notification No.F.9-36/2006-U.3(A) Dt. 25th May 2007, MHRD, Government of India.) announced separate entrance for PG seats.